Everybody has been there. Valentine’s Day is fast approaching, but this year you don’t exactly have the funds for a top of the line gift. Maybe you’re having a slow month at work, or maybe you’re still paying off your Christmas gifts, but for whatever reason you’re a little low on cash for a Valentine’s Day gift. Maybe even your Valentine told you that you don’t need to her a gift, but everybody knows that’s a trap. If you’re having trouble finding a Valentine’s Day gift that won’t break the bank, check out these tips for outstanding Valentine’s Day gift ideas at a great price. So maybe you can’t afford to get your loved one a gift certificate to the spa this year, that doesn’t mean you can’t provide a similar gift. Create a “spa kit” by getting a bunch of goodies and putting them in a basket, and wrap it up nice. There are a number of things you can include in a “spa kit”, but make sure you include a luxury bubble bath and some nice bath salts. Even a nice loofa and some body scrubs would be great to include, and you can get all these things at the mall for less than $50. Make sure you include some yummy smelling candles and oils, so your Valentine can turn the bathroom into a beautiful spa. If you don’t know where to find this kind of stuff, check out www.yellowpagesunited.co to get pointed in the right direction. If you were planning a nice dinner at an exotic restaurant to be your Valentine’s Day gift, save some money by doing it yourself. Sure, everybody goes out to a nice restaurant on Valentine’s Day since it’s tradition, but cooking dinner yourself will be more affordable and more romantic. Find a good recipe that you can cook before hand, and pack it up in a picnic basket, and then head to a local lighted park or beautiful scenic view, and you’re set. Make sure you cook a dinner that will save a few hours, and be sure that you bring desert. 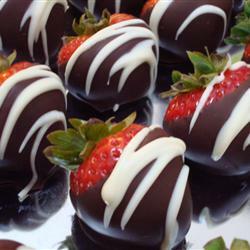 Chocolate dipped strawberries are a great choice. Be sure you leave lots of time to cook, so you aren’t rushed. If you really want to surprise her, take some time to make a beautiful scrapbook of your time together. Make it like a timeline; take pictures from the beginning of your romance and put them in the beginning of the book, adding notes about where they were taken and what you were feeling. Build the suspense throughout the scrapbook, and on the last page leave it blank so you can add a photo of the two of you together on that Valentine’s Day. If you really want to get creative, create a soundtrack based on your time together, and try and have it sync to different pages of the book. Your Valentine will no doubt love the time and creativity that you put in to making this beautiful and inexpensive Valentine’s Day gift.